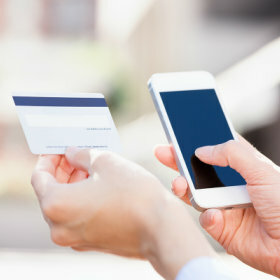 Sign up for mobile banking today! Imagine getting through life without ever having to dig for change — or worse, write a check. Use your free Visa® for purchases around the globe and online. Our debit card is safer than carrying cash and more readily accepted than checks. The very same card is used to make ATM withdrawals. One tiny piece of plastic — a whole lot of versatility. Cards now upgraded to chip cards for extra security. Where can I use my chip card? You can use this new card anywhere that you could use your old one. How do I use this new chip card? If the chip card slot is available, insert your card into the slot face up, with the computer chip first. Leave the card in the machine until the transaction has finished processing. What if they don't have a new chip-enabled terminal? If there is no slot for the chip card, you use your debit card as you normally would by swiping it. Does this chip card change how I order things online or by phone? The chip card only changes how you would use it in person at a business's point of sale area. There is no change to how you would use it online or over the phone. © 2019. Portions copyright © BancVue Ltd. All rights reserved.